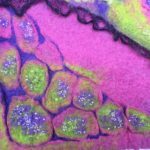 Madeline Beaudry is a fiber artist living in Rhode Island and working at Rue Magic Studio. 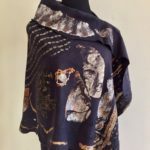 Many of her works incorporate hand dyed and eco printed silk as well as wool. Additionally she uses her felting skills in crafting hand made dolls. Her works can be seen regularly at the Artists’ Cooperative Gallery(ACGOW) in Westerly RI. 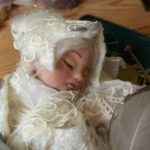 In addition to ACGOW, she is a member of the Professional Doll Makers Art Guild and the Florida Women’s Art Association. 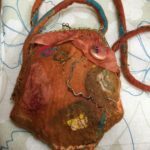 In 2017, Ms. Beaudry was awarded the Mabel Kingsbury Fentress Award for Fine Craft at the 2017 Regional Art exhibit at the Artists’ Cooperative Gallery of Westerly. 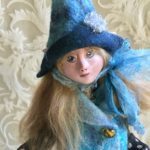 Her dolls, felted pieces, paintings and other crafts are in many private collections throughout the country. Rue: The Herb of Grace. Ancient people burned rue to dispel evil and create an opening to divine grace. Rue is also said to thin the veil separating the seen and the unseen world. It has taken me over 60 years of living to have the courage to call myself an artist. If one were to ask me why I create, I would answer simply,” Because I must”. My first love, and always will be my deepest artistic passion, was clay. 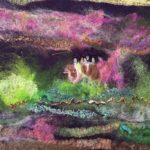 Life changes made it an impossible medium for me so I gravitated to fiber which, when working with wool, is very similar to clay. Each medium offers a variety of artistic expressions both functional and sculptural, both require an addition of energy to arrive at their final form, both can and should participate with the artist in their creation, and both media nourished my desire to make dolls. Creating a doll as a work of art is slowly gaining appreciation in our American culture. Dolls are often looked on as only something to play with. In my work I strive to transform that concept from playthings for children to intricate works of art. My dolls are completely hand made. Even the cloth used in the armature and the clothing is hand felted and often hand dyed. In doll making, I try to tell stories. Stories from nature, history, the world of dreams and fantasy, the spiritual world and the unconscious. Every step in making a doll is an adventure, but nothing compares to that moment when the doll becomes “someone”, that moment when she or he is looking back at me with a personality and life all their own. It is a moment of pure joy and thanksgiving. When I create clothing, it is my hope that this same magic becomes incorporated into each piece. Silk, wool, cotton, colors and textures all meld into a seamless tapestry of love and warmth. The beauty of nature finds a way onto silk through the process of eco printing. All elements working together to tell a story: fireflies dancing on a summer evening, spring rain, winter fire, stardust in the heavens. It is my hope that anyone who lives with or wears one of my creations comes a little closer to the beautiful, unseen world of mystery and magic.